United have confirmed the acquisition of two more first-year scholars. 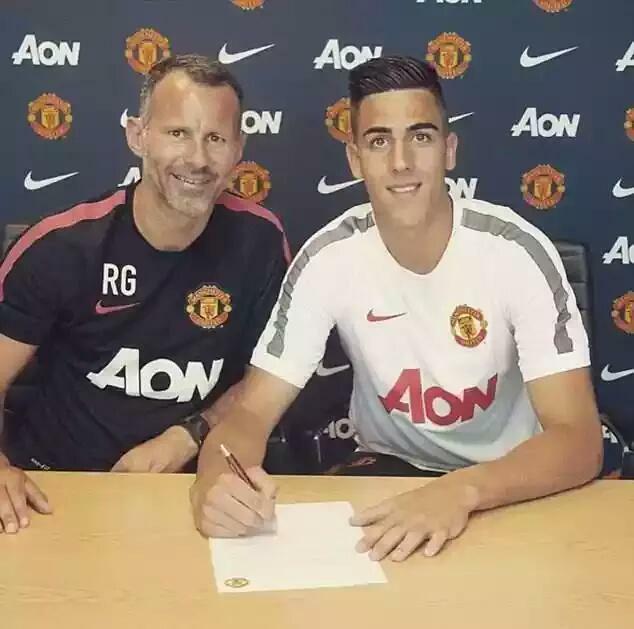 Goalkeeper Joel Castro Pereira has signed for the club after a successful trial. The Switzerland-born shot-stopper, 16, will add to the options between the sticks for coach Paul McGuinness. Sean Goss, who turns 17 in October, is the other new face after appearing for the Reds during last season's Aegon Future Cup, helping the team to reach the final in Amsterdam. The Germany-born midfielder has sealed a switch from Exeter City and recently revealed he has always been a United supporter. Sutherland turns 18 in September - I think he should be eligible for the U18s next season? Sutherland(? ), Gollini and Pereira are McGuinness' options. Pretty sure he is eligible. Add Kieran O'Hara to that list. Seems odd to have another U18 keeper when there's a gap at Reserve level if Amos and Johnstone go on loan. Sutherland I think would be next in line for the reserves, very impressive in the FAYC. PAYERNE • He's only 15 years old and just had a week of testing with Manchester United. The Dollhouse, Joel Dinis Pereira Castro does not know. This is his first interview. It has the courtesy of a shy teenager. Yet it measures "1m88 and a half," he says. "And I'll still take a few centimeters." For a goalie, it counts. For now, it's his bowl brush that grows. Yet Joel Dinis Pereira Castro has already taken many steps, fast, very fast. In December, the one who made his football school in Le Locle was even propelled the seventh best keeper in the world in his age group at the site of footballyouthtalent.com. A classification that perspective: "I'm pleased, but I do not give so much importance. I do not think those who went to see this site all the players of my age, around the world. " Nicknamed by his coach "El Gato" - the cat - when he became keeper by accident, because he wanted someone to this position, the kid has probably made the choice of his life without knowing it. "I was called that because I was jumping around, he smiled. Now, no one uses this nickname. " It might come back. For a year and a half, Joel Castro Dinis Pereira lives in Payerne and attended the pre-training center of the Swiss Football Association (SFA). All rushed to him in recent months. On the one hand its future is more uncertain with Xamax where it evolves in M18 and the other, just go for a week of tests at Manchester United. "It's amazing what happens to me, he tries to step back. My current club collapses, even if those responsible for training to do everything we can finish the season in juniors. At the same time, I find myself eating in the same room as Mr. Ferguson, with all its players. "He pauses before continuing, biting his wrist:" I think I'm a little young to think about all this . For now, though I really want to finish my training at Payerne. " Contacted by many clubs have their Alemannic and foreign-to go do some tests, it was Manchester United that he decided to try his luck. "It is through my agent, a Luxembourg national who lives in Zurich, as it happened, he says. Several recruiters from Manchester had seen me play this fall, especially in a match of the Swiss team of M16 against Italy. " Neuchâtelois the original Portuguese landed at Old Trafford in January with his father and his agent. He trains all week with the M18 in Manchester, playing one game with the M16 and the club even offers a workout with the keepers of the first team. Joel Dinis Pereira Castro is pretty quiet when he tells his experience. It would almost want to keep it to himself, lest it disappear or fear that everything stops. Yet it is real. February 27 to March 3, Manchester United wants to see him again at work in his den. "We feel that this is a family there, he says. At noon, everyone eats together, whether one is M18, or reservist of the first team. Alex Ferguson enters, and greets everyone comes to eat with us. Nobody seems above the other, that's what hit me. I have not spoken with him because I was intimidated and my English, it's not that. But my father and the agent discussed, mainly the structure of training. " At Payerne, Joel Dinis Pereira Castro sharing the lives of Marcuard, the oldest of the Foster Family Center preformation which celebrates its tenth anniversary. Up at 6:30, one who has a reputation as a teaser being happy off the field wielding puns graduate from school to school in Behind-the-Tower. With training every day, his dinner and supper in the structure of the ASF, the guardian of 15 years has drawn all his days. He's used. Since he was 12 years, it is selected. "At that age, I went from two to four sessions per week, remembers the old Le Locle. I had to take the train to La Chaux-de-Fonds and then a bus to take me down to Neuchâtel with the M13. It was more intense, more serious. We were taught the proper behavior of an elite footballer. " A year later, Joel Castro Dinis Pereira participated in tests with 80 players in Vevey, under the gaze of José Ehrbar and Michael Mora, the coach of the ASF. It is retained in the top 20 for final consideration of passage in Payerne. He will be among the nine selected Romands. "I was stressed out, I had to succeed, remembers there. Ehrbar Jose called me at home the night before a match to tell me that I was given and it should not I worry the next day to see him on the sidelines, he was there to see other players. " He could start at Payerne, leaving his family at age 14. "At first, the drives were very hard, he observes. I was afraid I would not do it because there are players who are taller. But the integration is done quickly because we all have a sponsor in the center. This is an older player who lives in the same family as us. Then it's our turn to be a sponsor and to the new trust. "Only open to challenge since arriving at Payerne: food tasty little too balanced or the canteen which is struggling to please teens. We have seen worse. Agree. Not seen much this season but was underwhelmed last season, a lot better this season. Joel Pereira have signed a new deal. Benfica are impressed by Pereira (on loan at Belenenses) and consider him a target to replace current GK. Hope we get a buy back in there if he does go as think he's too good to lose without one. Seems like Pereira will return to us as 3rd choice with Johnstone going out on loan now. Good system that from Jose, allowing both to have regular first team game time elsewhere for half a season and also half a season training with the club's top coaches and De Gea and Romero. Brilliant save from the freekick. He did alright. Yeah he did ok. Looked a bit shaky when clearing the ball. But that's understandable as it was his full debut at the biggest of stages. Guessing he will go out on loan again next season but seems very highly rated. Clean sheet on his debut as well bet he's buzzing. What I liked most about him today was struggled with first corner with McArthur I think hassling him and not allowing him to get out to the ball but he learnt from that straight away and dealt with the next corner superbly despite McArthur trying the same thing. I thought the save from FK was pretty routine but impressive that he caught the ball rather than parrying it. Clearances were a problem particularly early on. Things still to work on but he's very young for a keeper so has plenty of time to improve. He's had a chance sooner than most do, Mourinho reckons he'll be Portugal's #1 in future so will be desperate to keep hold of him. He's kind of in an awkward position right now that in order for him to reach potential he needs to be playing but it's very unlikely he gets that learning time in a Utd shirt. The hope for Utd I guess is get him tied down to a long term contract then hopefully find him good loan moves at clubs where can develop and train on to the next level then maybe in 2 summers time we can decide if he's ready to come in. However, De Gea & Donnarrumma both got their chances at big clubs because of injuries to the guys ahead of them and once they got the chance they never looked back. Great to see him commit to the club but surely next season a loan awaits for him as he needs to be playing top level football.